TGS’ Kirchhoff depth migration has been proven to be one of the best Kirchhoff depth algorithms in the industry. It is a maximum energy implementation and utilizes 3D dynamic ray tracing. The algorithm supports isotropic, VTI and TTI anisotropy. It has been used extensively for narrow and wide-azimuth surveys in a wide variety of locations and geological settings. 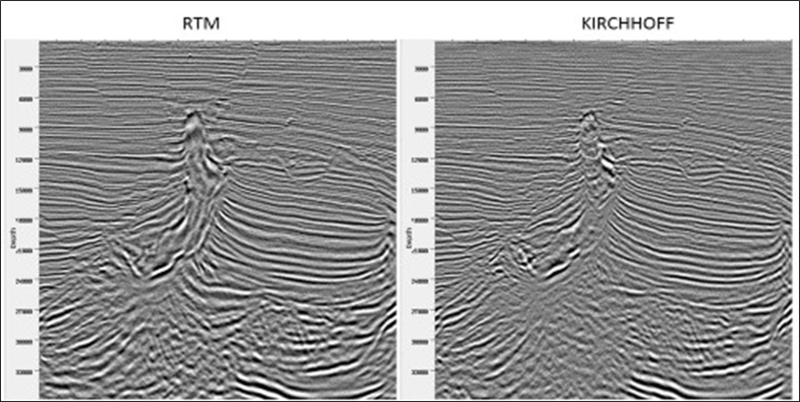 In Kirchhoff PSDM proper weighting function including geometrical-spreading compensation and Beylkin determinant is applied to preserve the migration amplitude for both flat and dipping reflectors. Zhang, Y., S. Gray, and J. Young, 2000, Exact and approximate weights for Kirchhoff migration: 70th Annual International Meeting, SEG, Expanded Abstracts.